Africa is evolving. Democracy is spreading across the continent. downturn. It’s just not fashionable any longer. The Board of Directors is responsible for setting the strategic direction for the Company and overseeing its business affairs in the accordance with the provision of the law and Articles of Association. The Board has adopted a written charter which guides its mode of operation. A Non-Executive Chairman leads the Board whilst the Group Chief Executive leads the executive management. The practices and procedures in place to improve board efficiency and effectiveness. The Board meets at least once every quarter. Additional meetings are scheduled whenever matters which require the attention of the Board arisies. The office of the Company Secretary circulates the agenda for each meeting along with all documents that the Directors would be required to deliberate upon in advance of the meeting. This enables the directors to apprise themselves of the matters to be discussed and contribute effectively at Board meetings. Directors are required to attend all meetings of the Board and committees they have been appointed to. Teleconference and video conferencing facilities are available for flexibility and cost effectiveness. Directors’ Induction Program: Newly appointed members of the Board are educated on the provisions of the Group’s Code of Business Conduct & Ethics and other related policies as part of the induction program. The programme also includes on-site visits to some of Oando’s facilities. This well-rounded/intensive induction process helps the directors understand the diverse nature of the businesses, the ethical values to which Oando subscribes and the culture of the organization; thereby enabling them to discharge their duties to all stakeholders effectively and efficiently. Continuing Education: Directors attend training’s and conferences on a wide-range of topics aimed at supporting their professional development and educating on recent regulatory changes that may affect the Company. The Board evaluation process also identifies skill gaps on the board and recommends ways to bridge those gaps. Individual development plans can then be drawn up for each director and implemented to bridge any knowledge gaps. The Ethics and Compliance Program strives to promote ethical conduct in all business dealings, train employees on ethical standards. The program is part of the effort to mitigate risks and address our core values. The Oando Code of Conduct and Ethics principally guide the business activities of the Group and is applicable to all directors, managers, employees and all third parties who work for and on behalf of Oando. The Company is committed to doing business in a clear, open and transparent manner and the global fight against corruption. The Group also supports and is associated with a number of external voluntary initiatives on anti-corruption (at local and international level) such as the Partnering Against Corruption Initiative (PACI); United Nations Global Compact (UNCG) and Convention on business Integrity (CBI). The Group’s Governance Office, led by the Company Secretary & Chief Compliance Officer is responsible for developing and implementing policies and the compliance infrastructure with support from business unites and entities. First Registrars Nigeria Limited, one of the leading registrars and transfer agents in Nigeria, render registrar services to Oando PLC. They are responsible the issuance of share certificates, dividend warrants, maintenance of the share register and other related services to our shareholders. Computershare South Africa renders the same services to our shareholders on the Johannesburg Stock Exchange (JSE) Limited. Our relationship with our shareholders is governed by the principles of accountability, transparency, fairness and respect. We are committed to the principles of accountability through the establishment of a properly constituted board of directors whose ultimate goal is to act always in the best interest of the company. The board is guided by the rules of good corporate governance. This is demonstrated by the various ways we communicate information to our investors in a clear and prompt manner and by our willingness to respond to concerns raised promptly. We effectively manage our relationship with our shareholders through transparent and appropriate disclosure of business and financial information. Company Information is disseminated through publications/corporate announcements on the company’s website,quarterly analyst calls led by the Group Chief Executive for the review of the company’s quarterly performance, and press publications. Statutory Meetings and shareholder forums also provide avenues for shareholders to provide feedback and participate actively in the decision-making process of the company. Management strategy and financial information are divulged in a transparent and timely manner. Shareholders of Oando PLC can specify the manner through which they want to receive the Annual Reports and other statutory reports of the Company. Shareholders who wish to receive correspondences from the Company in an electronic format may complete the Electronic Delivery Mandate Form and return same to the Company Secretary or First Registrars Nigeria Limited for processing. Notice is hereby given to all shareholders to open bank accounts, for the timely receipt of dividends. The Electronic Dividend Payment Mandate Form duly completed and signed by the shareholder(s) with the banks’ stamp affixed for authentication may be submitted to First Registrars Nigeria Limited for processing. All shareholders receive equal consideration regardless of the size of their holdings in the company. This is in line with Rule 22 of the Securities and Exchange Commission (SEC) Consolidated rules which requires information to be disseminated at the same time to all shareholders without preference. Shareholders are also represented on the Audit Committee of the Board of directors to facilitate involvement byinvestors in the financial review process of the company. We recognize the powers reserved for shareholders in the decision making process of the company hence our custom to keep shareholders fully informed and to seek their approval before embarking on major transactions or matters reserved for shareholders’ approval by the Companies and Allied Matters Act. GRMC is a management committee established pursuant to the Enterprise Risk Management strategy of Oando PLC. The Committee is mandated to develop policies and procedures for identifying, measuring and controlling risks identified in the Group’s risk universe. The Committee provides assurance to the Board and the Risk Environment HealthSecurity Safety and Quality Committee on the adequacy of the Group’s risk management systems as implemented and evaluate the Group’s risk profile, the action plans in place to manage high risks, and the progress against plans to achieve the Group’s risk strategy. Selected Senior Officers from across the Group provide risk management supervision through the GRMC. 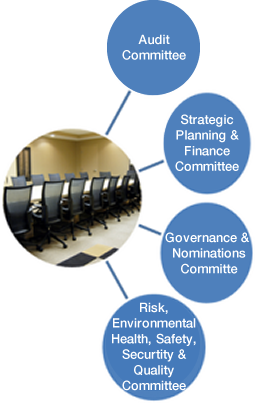 The Committee, which is chaired by the Group Chief Financial Officer, has a primary responsibility to provide independent risk oversight; facilitate, monitor and challenge the effectiveness and integrity of the risk management processes. The GRMC also reviews all the risk information and the analysis of the data as prepared by the Risk Management Department and approves the risk report that is presented to the Board Risk Committee (the Risk and Environmental, Health, Security, Safety, and Quality Committee). The Risk Management and Control department facilitates the identification, assessment, and management of risk for each of the group’s subsidiaries. The Internal Audit unit is an independent, objective assurance and consulting department designed to add value and improve Oando’s operations. The department helps Oando businesses accomplish their objectives by bringing a systematic, disciplined approach to evaluating and improving the effectiveness of risk management, control and governance processes. The department evaluates the adequacy, appropriateness, effectiveness and integrity of internal controls over financial reporting and business operations and proffer recommendations where weaknesses are noted. The Internal Audit performs a wide range of audit services including financial audits, compliance audits, operational audits, information technology audits, and investigations. A range of decisions are specifically reserved for the Board to ensure it retains proper direction and control of the Group. The Board is authorized to delegate some of these functions to executive directors who are responsible for the day to day management of the business. The document delegating Authority to certain directors and committees was approved in 2007 and sets the financial limits on the decisions that can be taken by the Executive Directors and the various committees of the board. The operations and activities of the Oando Group are in accordance with ethically acceptable and corporate governance best practices, as well as laws and regulations in the jurisdictions where we operate. At Oando, we are guided by various corporate governance codes such as the Securities and Exchange Commission’s Code of Corporate Governance for Public Companies 2013 (Nigeria), the King III Code of Corporate Governance (South Africa) and by integration, other acceptable corporate governance best practices. On the 9th of December of every year, Oando joins the rest of the world to commemorate the “International Anti-Corruption Day” in a bid to further entrench the ideals of good corporate governance and international best practice as an essential part of the Company’s culture. This annual commemoration is a clear demonstration of the company’s commitment in the fight against corruption as further encapsulated in our Anti-Corruption Policy. The policy highlights the measures in place to counter corruption-related business risks across all our operations whilst aiming to create and maintain a level playing field with fair competitiveness in our business dealings. The Company, its directors, employees and business partners are expected to comply with and uphold relevant laws for countering corruption and economic crime in all jurisdictions where the company operates; and are to be committed to the principles prohibiting corruption as prescribed by the various anti-corruption organizations to which the Company is a signatory. In 2008, Oando developed a “Business Partner Non Solicitation Policy” which all our Business Partners are required to execute. The key element of this measure is to ensure that our business partners also subscribe to the same high standards of integrity. The non-solicitation policy is a declaration that a business partner will not offer bribes to employees of Oando PLC. Oando is committed to doing business with only reputable, honest and qualified businesses. The Company and its employees exercise due care and take reasonable steps and precautions, geared towards evaluating the anti-corruption and bribery risks of engaging with prospective business partners. In an increasingly complex global business environment, it is crucial for us as a company to know exactly who our business partners are and the reputational risks when dealing with them. At Oando, we select our vendors on merit, competence, pricing, timely delivery through a competitive bidding process. The Procurement department identifies suitable and qualified vendors who have the capability to provide the required services or solutions to meet the user department’s requirement at the most competitive price. Only valid vendors with track records of performance are selected and registered for business dealings. The performance of vendors is monitored to determine if the business relationship should be continued or discontinued. Non – performing vendors are blacklisted and deactivated from the Oracle and unqualified vendors are not registered. The bid process is aimed at ensuring transparency and upholding the Company’s integrity in all tender processes for goods and services whilst simultaneouslyensuring that the company obtains value for money. The Governance Office has the responsibility for ensuring that the principles of transparency and fair-play govern the conduct of this exercise and has set down acceptable guidelines for conducting the process. In supporting the company’s fight against corruption and unethical practices, the company established a framework through which errant business partners may be suspended or blacklisted for failure to comply with Oando policies and procedures and the Code of Business Conduct and Ethics. The policy covers the adherence by Business Partners to contractual terms, safety, standards of ethics, financial propriety and human rights in the provision of goods and/ or services. Suspended business partners may be re-instated after a risk-based due diligence has been conducted by the Procurement and Governance units, to certify that structures have been put in place by the business partner to avoid a repeat of the brach that led to the suspension. Oando became a signatory to the Global Compact in July 2009 and has been an active participant in the Local Network of the Global Compact in Nigeria. The company is also a pioneer member of the Global Compact LEAD platform; a corporate sustainability leadership forum that provides the opportunity to implement the Blueprint for Corporate Sustainability Leadership (developed in close consultation with a large number of corporate participants and stakeholders and widely endorsed by business, governments, and civil society at the Leader’s Summit in New York in June 2010), and share related outcomes and learnings with the broader universe of companies. The UN Global Compact is a strategic policy initiative for businesses committed to aligning their operations and strategies with ten universally accepted principles in the areas of human rights, labour, environment and anti-corruption and reporting publicly on progress made in implementing these principles in their business operations. Furthermore, the company seconded its staff to work with the Local Networks Team of the Global Compact Office in New York for a 24-month period. This afforded the company the opportunity to contribute to the development of global sustainability agenda whilst building our capacity for demonstrating best practices in environmental, social and governance issues. The Partnering Against Corruption Initiative (PACI) was formally launched in January 2004. The initiative brings together companies from various industries and regions to fight bribery and corruption through the implementation of a zero tolerance policy towards bribery and the establishment of an effective internal anti-corruption programme. The organization offers a risk mitigation platform to help companies design and implement effective policies and systems to prevent, detect and address corruption issues. CBi is an organisation established for the maintenance of ethical conduct, competence, transparency and accountability by private sector operators. CBi was established to empower business transactions within Nigeria against corruption and corrupt practices. Oando became the 21st member to sign unto the Convention on November 16, 2009. Following the recent business integrity failure and regulatory lapses in Nigeria, the CBi began to focus on the promotion of a collaborative approach of promoting public-private sector partnership by hosting roundtable discussions with select groups of leaders of key government regulatory bodies and members of the business community to identify and implement sustainable models for corporate control against corrupt practices in Nigeria.